The following are my reflections on the 2012 striped bass fishing season. The include my own personal experiences, plus information I gathered from other fishing guides, friends and general sources. I will not attempt to summarize the entire season along the entire Atlantic coast. Far from it. I fished only in Massachusetts and Maine. 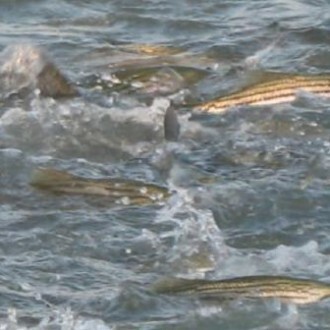 In my opinion, the 2012 fishing season reflected closely the current status of the striped bass population, which is characterized as having healthy numbers of breeding size fish over 28 inches, but is lacking fish under 28 inches due to repeatedly weak spawning success following very successful years in 2001 and 2003. Fish from 2001 and 2003 are now the foundation of the population but fishing mortality rates on those fish are too high in my opinion. They represent the bulk of what is referred to scientifically as the spawning stock biomass or SSB. The SSB drives all the models for the striped bass population because of its importance in the spawning cycle. Although the SSB is still above the minimum thresh hold levels, the SSB is declining because too many bass in those critical year classes are being killed. And unfortunately, except for the 2011 spawning season, every other year since 2003 has been weak for spawning success. So the math is simple – too many fish from the SSB are being killed and weak recruitment. The result is a population overall that has been declining for the past 7-8 years at least. And concurrently, the recreational catch along the entire east coast has decline as well by 70% over the same time period. So how does this affect fishing? It’s quite simple. If you are a good enough angler who can find those schools of fish from the SSB, meaning fish generally 28 inches or larger, then you are in for some fantastic quality striped bass fishing. It is safe to say that most of the time, it requires a boat to get on these older fish as they are often away from the coastline. But even when they do come ashore, it is not for long. And inshore or offshore, these school of bigger fish are generally on the move with the bait. Again, if you get on these fish, it may be some of the best fishing you have had in years, but if not, it can be deader than dead. Feast or famine. A healthy population with an even age distribution would provide fish of all sizes in many locations. 10-20 years ago catching 20, 30, 50 “schoolies” was not uncommon. In 2012, that was rare because those younger year classes are scarce. And without these younger fish fill in behind the older breeding fish, I am afraid there is potential for the striped bass population to decline significantly further in size before it ever starts to grow again. A very scary thought! My 2012 season started in the tidal creaks of the Great Marsh, generally on the Parker River. I started wading the banks throwing herring flies several miles up stream from the coast in April. I never really got on any bass doing this but I knew guys who were having success. I just never hit it on the perfect time and tide. My first bass was in early May from my boat on the Parker River but down in Plum Island Sound, where fish were holding up on structure but also starting to feed on the surface on herring. Awesome action but hit or miss too. Most of the fish were over 25 inches. Few schoolies although I did get a few bass under 20 inches. I also had a 3 day trip to Cape Cod, where we had a good cinder worm hatch in a slat pond there, plus some excellent fishing in the Elizabeth Islands. Later in May I turned my focus to the Merrimack River. By Memorial Day weekend, the fishing on the Merrimack was good although at times challenging as fish were not always showing and were finicky for certain flies and lures. June should be and typically is the best month for striped bass fishing everywhere. A major nor’easter to start the month killed some very good tides but things eventually settled down. The Merrimack fished very well in June, with bass both inside the river and on Joppa Flats, plus outside. We also had some bluefish by the end of June outside primarily. I also spent 4 days fishing around Martha’s Vineyard and the Elizabeth Islands, where the bass were spotty and snapper bluefish were everywhere. We managed a few big bass but not many. I was also hearing reports of some good bass fishing in southern Maine but I would not get up there until July. July was a very interesting month because we had some outstanding fishing for bass off the Merrimack and I also was able to fish over some large schools of feeding bass in southern Maine. If you were able to get on schools like these, it was as good as bass fishing gets. In July I also start stalking the beach front flats when skies are clear and ocean calm. I see a lot more fish – bass and blues – than I catch but I learn a lot about where fish are. These are typically cruising fish – singles, doubles, small schools and they are tough to get interested in a crab fly or lure. Still I find it fascinating and a great challenge. I also spend time in July on Joppa Flats, where big bass are often plentiful but very very difficult to catch during daylight hours. I typically will spend the predawn hour there, search for waking fish and then setting up on them if I find them. August was a mixed bag in 2012. There were more bluefish around than there had been for many years – big schools of 4-8 pounders cruising up down the Plum Island beachfront, usually inside a mile from the beach. It provided some super action. Bass were harder to find until toward the end of the month, when they started to show up in schools in a variety of places, staging for the fall migration. I wa able to find a couple of pods in along the beaches and hooked several 30+ inch on crab flies. After Labor Day, it is fall fishing for me and in 2012 I split my time between local waters and south of Cape Cod. Locally, there was some really good bass and bluefish action on certain days but it was a slower than hoped for month on the whole. Very disappointing as many of were hoping those schools of larger bas we had in June would be returning through the area. Never really happened in a sustained way. I did have one phenomenal day in late September during a late afternoon to dusk fish, where I found a couple schools of bass milling in 3-5 feet of water over light colored sand and I landed about 25 bass from 16-37 inches, all on crab flies. I was actually disappointed not to have landed more big fish – and they were there – but the smaller bass were quicker on the fly. The highlight of September was a 9 days on Martha’s Vineyard and the Elizabeth Islands, where we had great false albacore fishing daily. They were all under 8 pounds but an absolute blast. We also found some good bass here and there, and I managed to catch a 20.98 pounder that took first place in the MV Derby fly rod boat bass division. I made several more trips south of the Cape in October. The albies thinned out a lot and the bass were there in good catchable numbers but very few over 30 inches. Disappointing from an anglers viewpoint but great to see for the bass population. By mid-October I had hung up my fishing rods, put the boat away and picked up my bow in pursuit of white-tails. I fished hard with clients and personally, had my share of memorable days and a few clunkers where finding anything worthwhile was a chore. Without question I am eager to see 2013 unfold. [caption id="attachment_72" align="alignleft" width="440"] striped bass feeding[/caption] 2013 fishing Reports will begin to be posted here around May 1.